Europe and the Caribbean used to preoccupy the minds of the wanderlust, but increasingly, it seems that ship has sailed. Asia is the new travel hotspot, with the world flocking to its major cities for a taste of modern adventure. Indeed, rapid economic growth within the region has seen income levels in Asia surge by 87 percent, leading to a rise in inbound and outbound travel according to the 2016 Asia Tourism Trends report by World Tourism Organization and Global Tourism Economy Research Centre. As a result, Asia has become the second-most visited continent in the world after Europe, and one of the fastest-growing in recent years. To tap into the rising popularity of Asia as a holiday destination, Dream Cruises designed the Genting Dream, which will be home ported in Singapore in December. Its five-night Island Escapade sails from Singapore to Kuala Lumpur, Penang and Phuket’s Patong Bay before heading back to Singapore. On the last day of cruising, keep busy with an exciting range of entertainment and activities on-board, from parties presented by Zouk to adrenaline-pumping rope courses. Other highlights include a waterpark with six different slides, a handsome selection of bars and restaurants, and a celebrity chef at sea. Back in Phuket is the Kata Rocks Superyacht Rendezvous for its second instalment. The region’s superyacht owners and partners gather at the Kata Rocks resort for three days of entertainment and merrymaking, set against a spectacular display of luxurious superyachts. Kick off the first day with the thrilling King’s Cup Regatta, before an invitation-only champagne-tasting session in the afternoon at The Wine Cellar. On Cruise Day, tuck into a sumptuous beach barbeque followed by cocktails and tapas, before Sunset Cocktails & Tapas at Kata Rocks. When night falls, feast on an exclusive owners’ dinner for selected VIP guests. On the final day, check out the demos of marine toys. Rounding off the fun is a Kata Rocks Charter Season Opening Party with live band performances, DJ sets, delicious food and more. Norwegian Cruise Lines has turned its focus to Asian travellers. Tailored for Chinese travellers, the Norwegian Joy includes duty-free shopping, authentic Chinese cuisine, culturally inspired experiences and even a Mandarin-speaking crew. The first-ever contemporary cruise ship, custom-built for China, sails from Hong Kong to various parts of China, before heading eastwards to South Korea and Japan. For an experience that marries the flavours of both East and West, check out the 20-Day Transpacific from Tokyo and Alaska on the Norwegian Jewel in a fantastic voyage across Japan, Russia, Alaska and Washington. Silversea’s Silver Discoverer takes travellers through Asia in 2018 and among its highlights is its expedition from Colombo to Phuket. Uncover the splendour of Sri Lanka, India, Myanmar and Thailand via stately Buddhist temples and lovely seascapes and landscapes. This itinerary takes you to attractions such as the ancient Galle Fort in Sri Lanka (a Unesco World Heritage Site) and the country’s top ecotourism destination Yala National Park. Don’t miss, stops at Myanmar’s famous Lampi, Bo Cho and Frost isles, after which the vessel returns to Phuket. As the only French cruise in the world, you can expect the full Français experience — from interiors designed by Jean-Philippe Nuel to bath products by Hermès. Sailing through Asia between now and June next year, its L’Austral megayacht offers a relaxing ambience with a multitude of elegant touches. 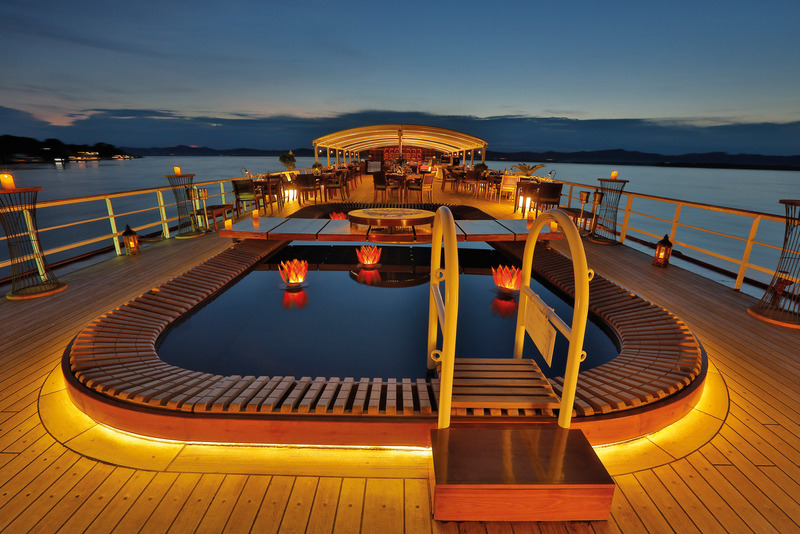 Embark on a heritage expedition across the gems of Southeast Asia, through the historical city of Yangon to the diver’s paradise that is the Mergui Archipelago. Island-hoppers, get ready to feel the buzz as you come face-to-face with the ivory shores, sparkling waters and amazing marine life. Uncover the wonders of Asia across Vietnam, Cambodia and the Mekong on this 15-day adventure with Uniworld River Cruises. Experience a piece of history at the Cu Chi tunnels, which played a crucial role during the Vietnam War, and sail down the Mekong river in a luxurious version of the traditional sampan until you arrive at the harbour of the Cai Be Floating Market. You also get to drop in at Cambodia’s Royal Palace, and check out its Throne Hall and Silver Pagoda, the latter named for its floor covered with 5,329 silver tiles. Look out for the famed Buddha statues, one in emerald and the other gilded with almost 10,000 diamonds, as you soak up the vibrant cultural vibe of Cambodia. Discover the heart of the ancient Khmer empire, starting from Siam Reap, while exploring the alluring city and its sprawling markets, lively dining scene and delicious street bites. Conclude your voyage in Hanoi, as you enjoy the city’s heady blend of contemporary and traditional.